As 2014 has already seen a month come and gone, let’s take the chance to recognize the work that was completed in 2013 as we look forward to the 2014 season. 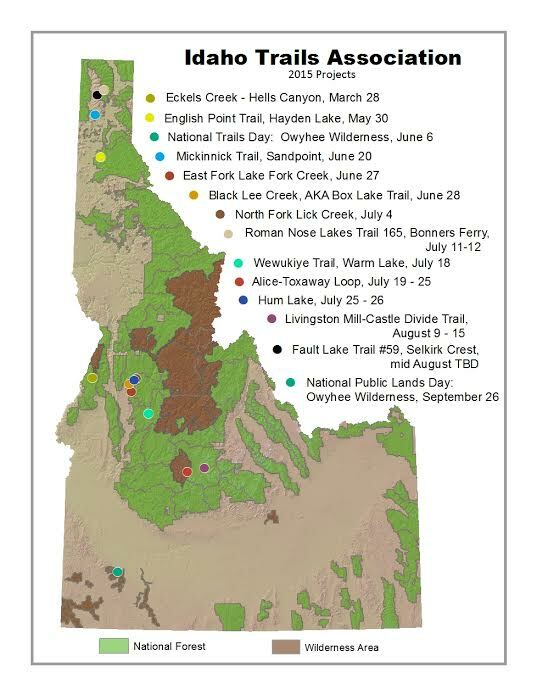 Projects in 2013 included maintenance completed on National Trails Day and National Public Lands Day. 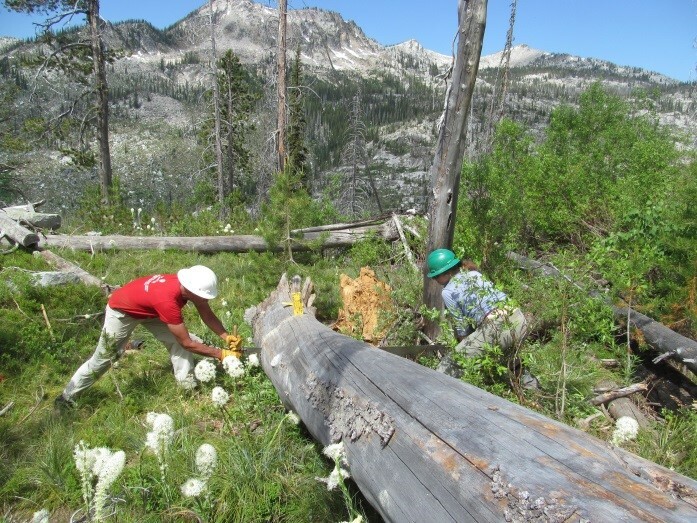 Work was completed in the Sawtooth National Forest, Salmon-Challis National Forest, and Payette National Forest. 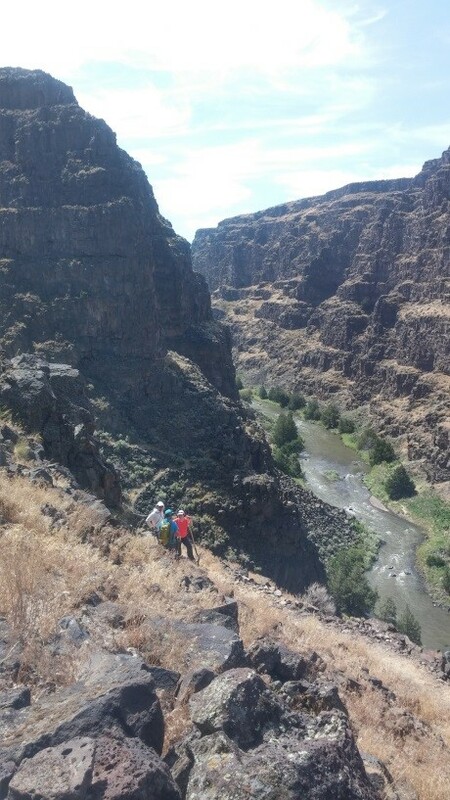 ITA worked with the BLM and REI on National Trails Day in the Bruneau-Jarbridge Rivers Wilderness Area and on National Public Lands Day in the Little Jacks Creek Wilderness. Here’s a quick recap of the seven projects completed in 2013. 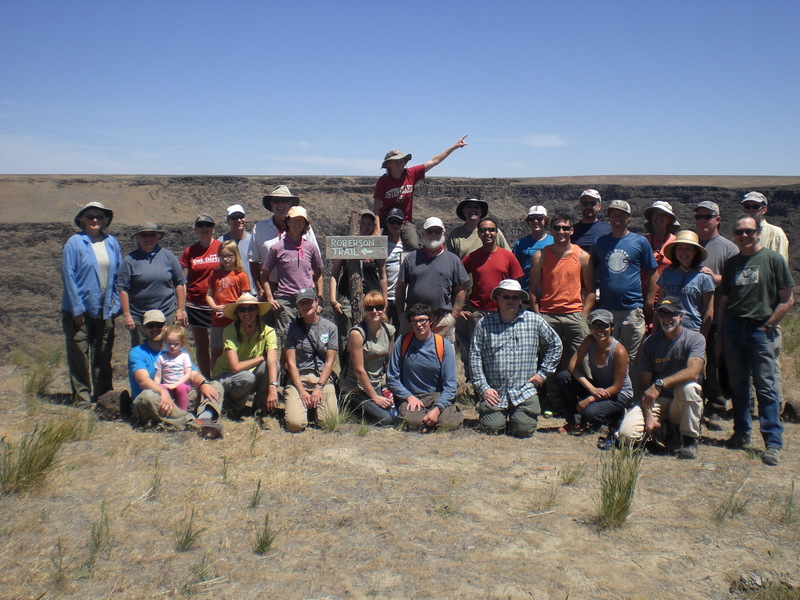 Roberson Trails Project was completed on National Trails Day with the help of 30 volunteers, BLM, and REI in Boise as a sponsor. Trail maintenance was completed in the Bruneau-Jarbridge Rivers Wilderness Area. 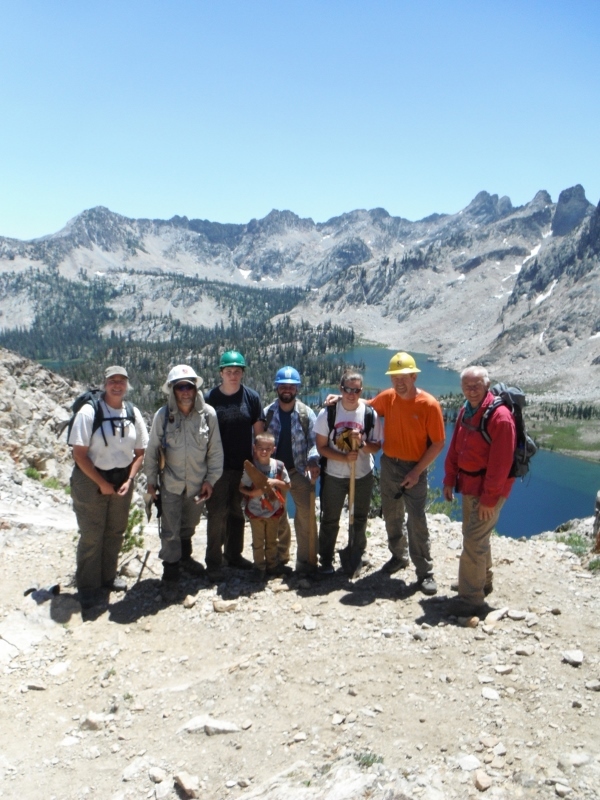 ITA provided 2 project leaders and the BLM provided 4 agency personnel — a great opportunity to learn about trail maintenance. New signs were constructed to make the trail more visible, along with clearing overgrown vegetation. Seven water bars were restored to reduce erosion from water. Several switchbacks also received some needed restoration. 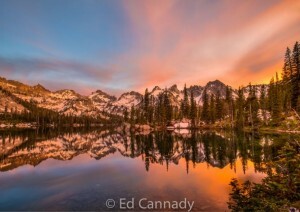 The Pioneer Cabin/Osberg Ridge Project was completed in the Sawtooth National Forest. Five volunteers, along with ITA project leader Michael Beaudoin, made the trip for this project. 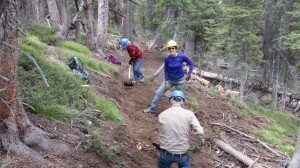 The crew constructed 2 miles of new trail to connect Osberg Ridge and Warm Springs Ridge Trail; maintained sections of trail along 4 mile hike into the work site; reconstructed drainage on Osberg Ridge Trail in an effort to reduce soil erosion and trail meandering. 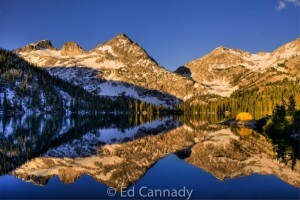 The Alice-Toxaway Loop is located in the Sawtooth Wilderness. ITA volunteers worked on this week long project with guidance from the USFS and funding from REI. Josh Wheeler, project leader for the ITA, provides a great description of the project here. Overall, 22 miles of trail was maintained, including 24 logs cut and removed, and 247 water bars cleaned or installed. 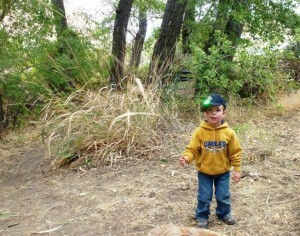 This project also provided the opportunity for two volunteers to bring their kids — a great experience for them! The Mt. 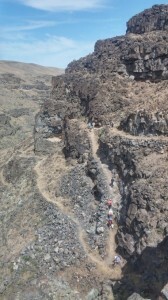 Borah Trail Project was a two part project completed in July and September. 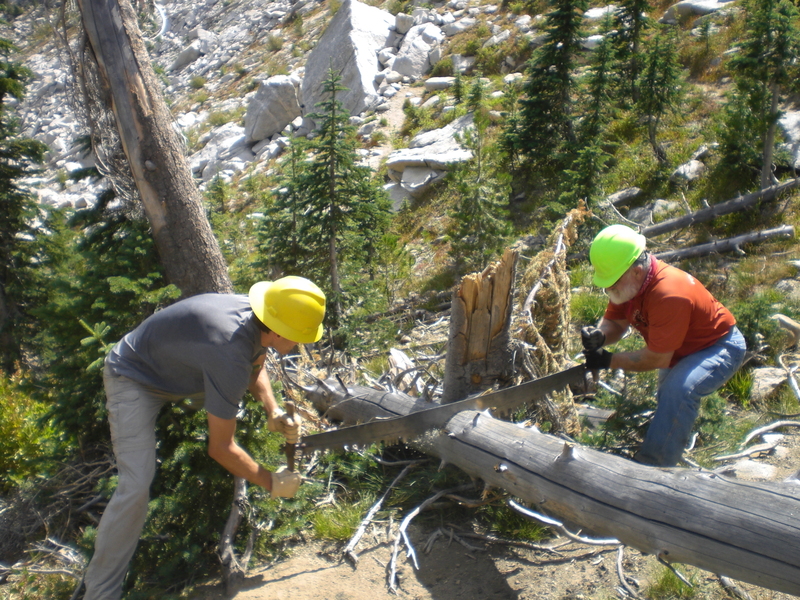 Work was completed in the Salmon-Challis National Forest. 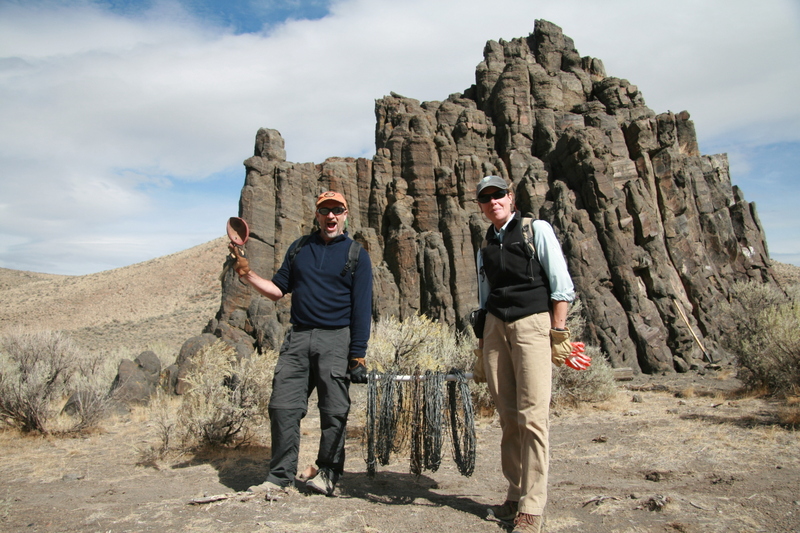 John McCarthy, the project leader for the ITA on the Mt. 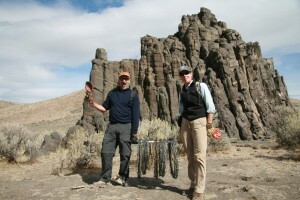 Borah project in July provides great commentary on the trip here. REI was a sponsor for the project. Accomplishments were a result of a total of 144 volunteer hours over the two projects. Tread reconstruction on the trails totaled 340′; 3 check steps constructed; 6 switchbacks were either constructed or reconstructed; 9500 square feet of braided trail rehabilitated; 14 waterbars cleaned; 1.4 miles of trail were rocked. 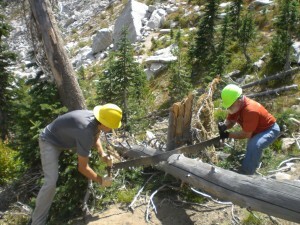 Great work done by the crew on the very popular trail to the summit of Mt. Borah! North Fork Lick Creek Trail Project was a 3 day project completed in the Payette National Forest. 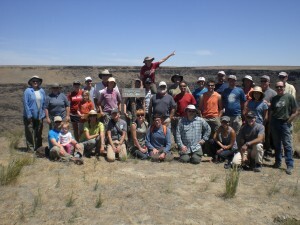 Six volunteers participated in this project. 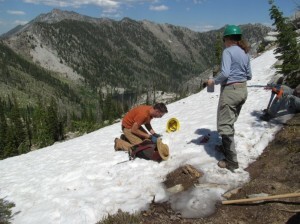 Maintenance was primarily on the Hum Lake Trail, a popular backpacking and day-hiking trail in McCall. Accomplishments include 2 miles of trails cleared; 26 logs cut and removed; 12 water bars cleaned or installed. This project to maintain the Hum and Duck Lake Trail is an ongoing partnership between the ITA and Payette National Forest. Keep your eyes open for this project on the 2014 project list! 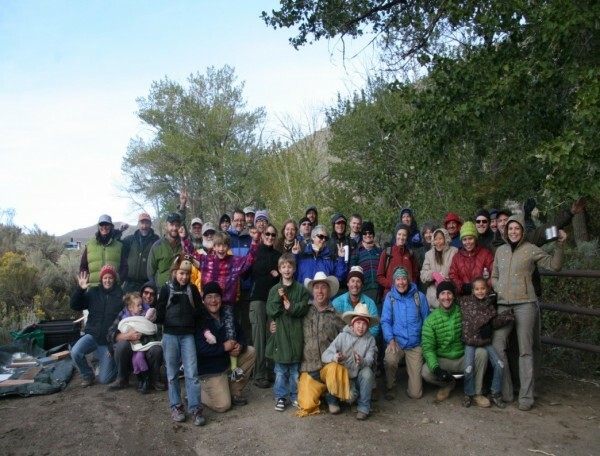 Shoofly Trail Project was completed on National Public Lands Day with the help of 33 volunteers. 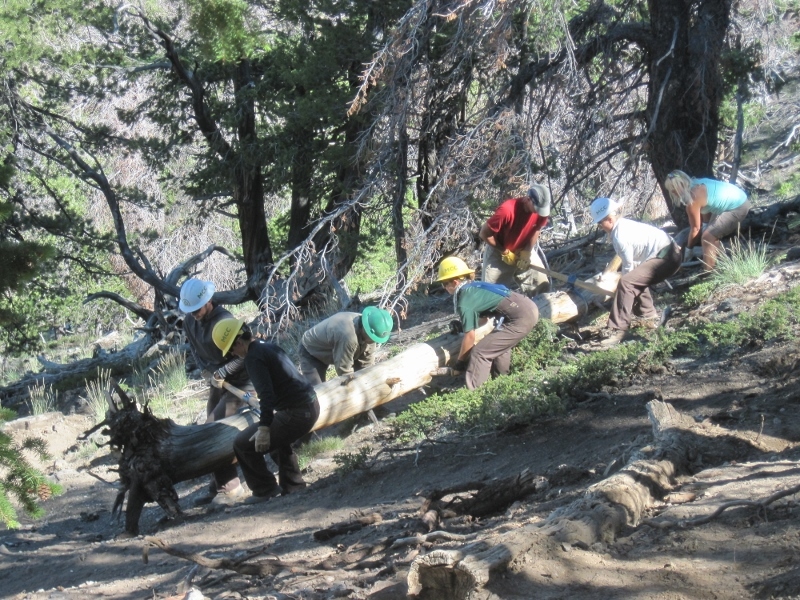 ITA had 3 project leaders on the trip and BLM provided 7 agency personnel — another great opportunity for an introductory experience into trail maintenance. A half mile of trail was cleared and a quarter mile of new trail was constructed. Volunteers also were able to experience a dutch oven lunch provided by BLM and the use of horses to pack out barbwire that was removed. The 2013 projects for ITA were a success and we look forward to 2014! 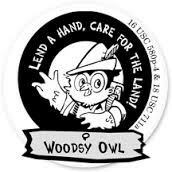 We’d like to thank all the volunteers who participated, agency personnel from BLM and USFS, and REI for sponsoring four projects!